TPC Overall Rank: #13 out of 2933 rides. In User Top 10: 74 times. User Tracker Count: 75 times. Its big. Its got lots of hills. Its got air time. Its got speed. Its got seemingly everything... but yet there are more fun coasters out there. Quantity does not always mean quality. Too much of a good thing (hills and air) can get a bit monotinous after a while. On an out and back "air machine" I am ususally a front seat rider... loving that pop of air at the crest of each hill. However, because of its size, Shivering Timbers doesnt seem to deliver this. The back seat is another story... Wild air on the drops. Still... its a good coaster, and certainly an impressive coaster. It just doesnt have the "WOW!" factor for me to bump it up from a 9 to a perfect 10. Oh Man! I dont know how anyone can seriously give this lower than a 9 rating. The airtime is insane (its a toss-up between this and Phoenix for the best consistent airtime throughout the ride). This sort of restores faith in the bigger can be better argument. The second and fourth drops provide insane floater air. The turnaround provides throw you out of the right side of the car lats. The airtime continues on the trip back and includes a nice little trick track. But youre not done there folks. The ending helix is powerful and intense. I rode it 18 times over the course of my time at MiA and enjoyed every ride, but as with most woodies you have to ride in the back. Right hand side for a wilder ride. This coaster is amazing. Its one of my favorite wooden coasters. I rode it twenty times when I visited the park. It has tons of hills, airtime, trick -track and a helix. It never lets up from srart to finish. 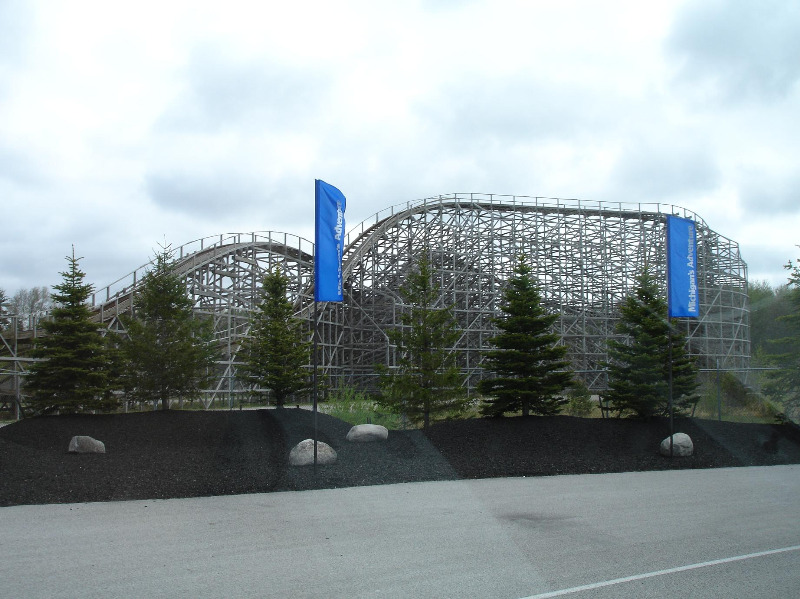 The Shivering Timbers is a wood out and back roller coaster. It was built by CCI and designed by Larry Bill in 1998. It is 125' tall, it is 5, 384' long. It is fast, fun, rerideable, it has a large capacity, and a long duration. Times ridden: 2 ~ Ride experience: 10 ~ Layout: 10 ~ Thrill factor: 10 ~ Airtime: 10 ~ Landscaping: 6 ~ Evaluation: One word, amazing. The ride is unbelievable, featuring a massive out-and-back design with hill after hill of airtime. Features found on this ride include more than a mile of wooden track, a double-up, a trick track, and a helix finale. Shivering Timbers is well paced and smooth making the experience very enjoyable. A top five woodie to be sure. It just towers over you as you enter the parking lot. Those hills give so much air, and the third one is insane. The trick track in the middle of the ride can be a tad rough in the back, but other than that it is awesome. Back row on the first drop will rip you out of your seat. Just got back and I rode this ride 14 times. On off the best woodies out there. I love this ride, I only hope that MA puts one more good coaster there so I can go every year. The best out and back woodie Ive ever rode. APPEARANCE-9 The only reason its not a ten is because it has parking lot on one side and cleared out land on the other. The ride itself looks fantastic and the way the sun sets on it and the way it brings out the yellow is truly great. RIDE QUALITY -10 Excellent! This ride is a mile long and has one rough spot right after the turnaround before the trick track. The airtime is intense especially the fourth hill. Other then the Phoenix the airtime king. The helix at the end is very intense and at Timbersfest it was almost impossible to keep your hands up. CAPACITY -10 It looks like they could run three trains, but considering the length of the ride the line moves quick and they do a good job of loading and unloading. FUN-10 I was laughing till I cried the first time I rode it. The difference between this and Phoenix is so small you can hardly measure it. I love the fact that they are both at smaller parks it should show the Six Flags of the world to try something different more often. RERIDE-18- No just kidding it gets a 10. I just rode it 18 times the first time I went there. 18 rides should explain the reride rank. OVERALL-49 AVG 9.8 So definately a ten. I dont know how anyone could score it less unless they are trying to move a ride up the chart by knocking this one down. On a side note this is a truly beautiful park and I hope they do Timbersfest again since it has not shown up on their calendar. When I went the staff was excellent, the free food was good, and the old owner was there to speak and ride. They even responded to an email within a week. Truly amazing and this year I have a season pass. They are adding more to their waterpark this year which is also very good, but they really need one more coaster to be a more national park. Only ride worth going on at Michigans Adventure. Best Wooden rollercoaster I have ever been on. Shivering Timbers is a good ride, but I feel its been overrated just a little. The big hills all have good floating air and the return romp through the structure has seemingly endless pops of harder airtime, trick track, and a really claustrophobic feeling from all the wood seeming to come closer and closer with every hill. Its also a really long woodie. However, I dock it a bit because the helix and bottom of the first couple drops are actually pretty painful. I worry that they are nto taking great care of the ride. Its still good, I just dont know that its the perfect thing that most people seem to think it is. This ride is the bomb. It is the best ride I have ever riddin. My buddy tornbretto has riddin it too. Just to let you know. Just RIDE IT. I am the rollor coaster madman in the house.